In the following examples, the use of a resource is often demonstrated for only one of the four axes. Most tick mark resources have similar versions for all 4 axes. Example 3, for instance, demonstrates specifying the bottom X-axis tick mark label font height by setting tmXBLabelFontHeightF. Similar resources exist for the other 3 axes: tmYLLabelFontHeightF, tmXTLabelFontHeightF, and tmYRLabelFontHeightF. tm_1.ncl: Simple XY plot with a set plot size and a set range for both the X and Y axis. trYMinF, trYMaxF, trXMinF and trXMaxF allow the user to set the minimum Y-axis value, the maximum Y-axis value, the minimum X-axis value, and the maximum X-axis value. vpWidthF (vpHeightF) allows the user to set the width (height) of the XY plot in NDC coordinates. The second frame shows how to force the X-axis tickmark labeling to start on the first value, by setting tmXBMode to "Manual" and tmXBTickStartF to the minimum value of the X-axis. tm_2.ncl: Demonstrates how to specify tick mark labels and minor tick marks. By default, tmXBMode is set to Automatic, automatically generating the bottom X-axis tick mark labels. For the top panel, tmXBMode is set to Manual, tmXBTickStartF, tmXBTickStartF, and tmXBTickSpacingF are then used to manually set the bottom X-axis labels. For the bottom panel, tmXBMode is set to Explicit, and tmXBValues and tmXBLabels are used to set the bottom X-axis labels. This setting allows the user to explicitly specify labels. Note, when tmXBMode is set to Explicit, the bottom X-axis minor tick marks are automatically removed. To explicitly specify what bottom X-axis minor tick marks are shown, tmXBMinorValues must be used. tm_3.ncl: Shows how to remove axis borders, tick marks, and tick mark labels. Demonstrates how to adjust the font height of tick mark labels. (Top Panel) By setting tmYROn to False and tmYRBorderOn to False, the right Y-axis is completely turned off. 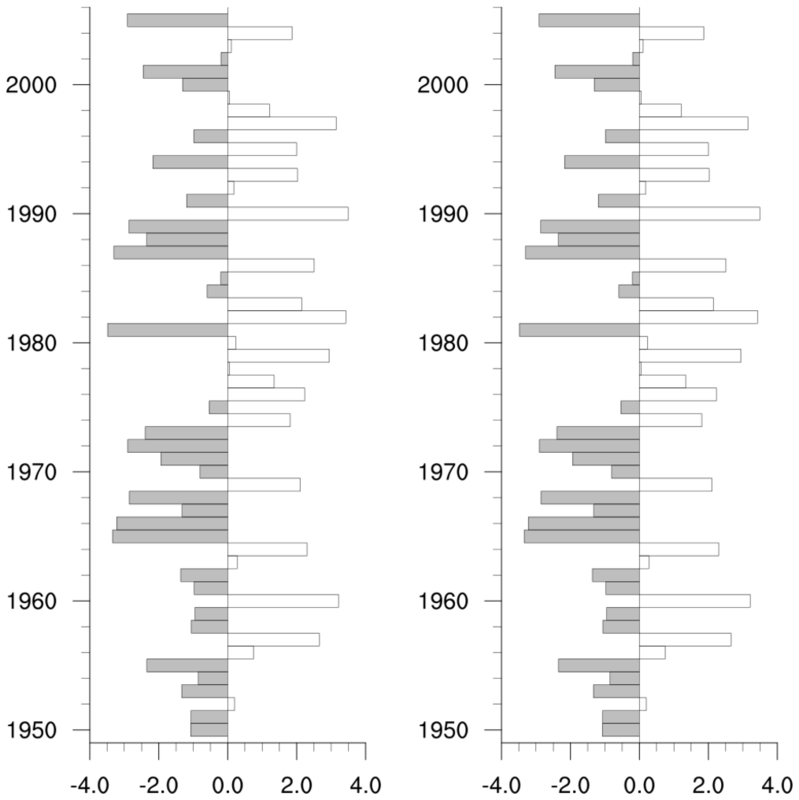 (The right Y-axis and top X-axis labels are by default turned off.) 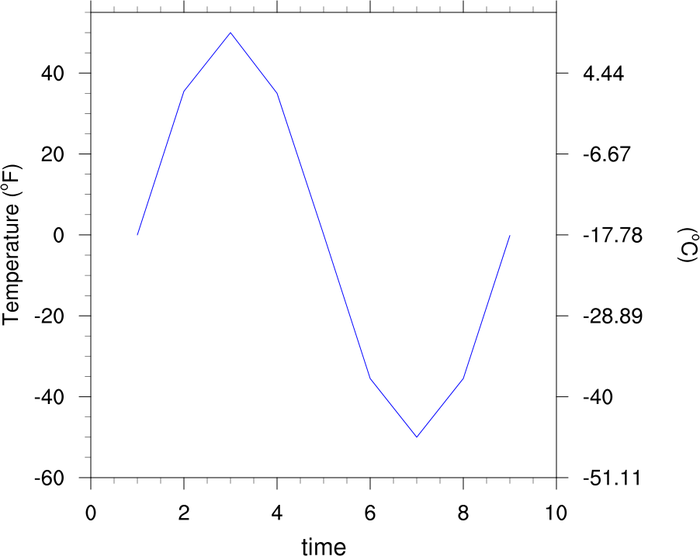 The same is done to the top X-axis, using tmXTOn and tmXTBorderOn. (Bottom Panel) tmXBLabelFontHeightF is used to set the bottom X-axis tick mark label font size, and tmYLLabelsOn is used to remove the left Y-axis tick mark labels. This capability is only available in NCL version 6.4.0 or later. tm_4.ncl: Demonstrates how to change the formatting and precision of tick mark labels. The top panel shows the default formatting of the left Y-axis and bottom X-axis. The default setting of tmYLFormat / tmXBFormat is "0@*+^sg". For an explanation of what this means, refer to documentation of the HLU Floating Point Format Specification scheme. For the middle panel, tmYLFormat is set to "0*+^e", which forces use of the lower case exponential format (e) for the left Y-axis tick mark labels. The precision of the bottom X-axis labels is set by setting tmXBPrecision. tm_5.ncl: Demonstrates how to reverse the Y-axis, and change the angle, position, and color of tick mark labels. trYReverse is used to reverse the Y-axis, tmXBLabelAngleF alters the angle of the bottom X-axis labels, tmXBLabelFontColor sets the color of the bottom X-axis labels, and tmXBLabelDeltaF sets the amount the bottom X-axis labels are offset from the plot. tm_6.ncl: Shows how to format the two Y-axis differently, how to alter the appearance of the tick marks, and how to move the Y-axis title to the righthand side of the plot. tmYUseLeft is by default set to True, which automatically formats the the right Y-axis the same as the left Y-axis. By setting tmYUseLeft to False, the user is allowed to specify different formatting for the right Y-axis when compared to the left Y-axis. tmYRLabelFontColor can now be used to set the right Y-axis tick mark label font color, and tmYRPrecision can be used to set the precision of the right Y-axis tick mark labels. If tmYUseLeft was set to True, tmYRLabelFontColor and tmYRPrecision would have no effect. tmXBMinorLengthF and tmXBMinorOutwardLengthF work the same way, except for the bottom X-axis minor tick marks. In this case, tmXBMinorLengthF is set to 0.008, and tmXBMinorOutwardLengthF is set to 0.015. Thus, the bottom X-axis minor tick marks will start at 0.015 NDC units away from the tick mark border, and be 0.008 NDC units long, leaving some white space between the minor tick marks and the tick mark border. 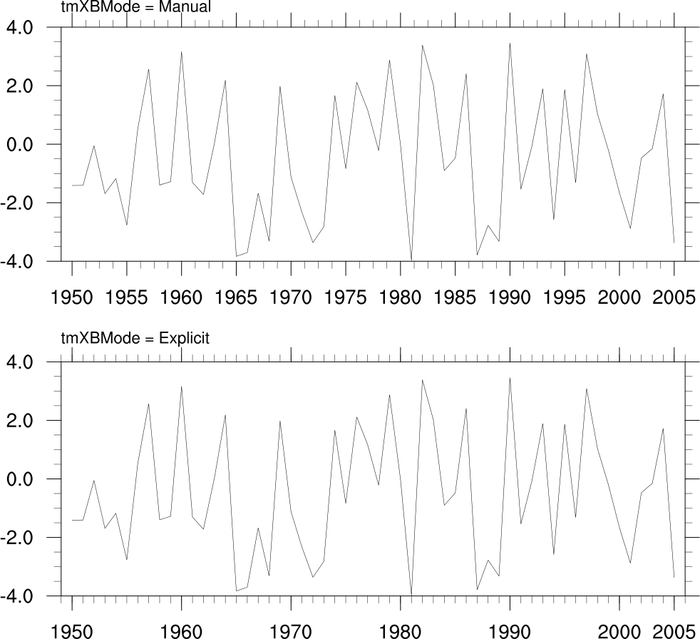 tiYAxisSide is set to Right, moving the Y-axis label to the right hand side of the plot. tm_7.ncl: Shows how to set the Y-axis to a logorithmic scale, and how to set the tick mark labeling interval. 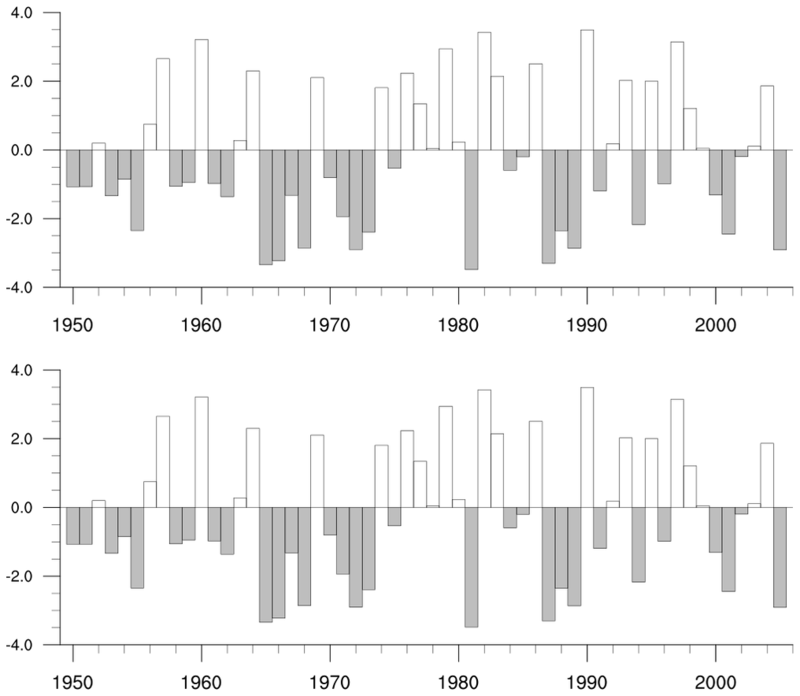 The left panel shows the default linear Y-axis, along with labels on every bottom X-axis major tick mark. The right panel shows a logorithmic Y-axis, and labels on every other bottom X-axis major tick mark. The Y-axis scale is changed by setting trYLog to True, and the labeling interval of the bottom X-axis tick marks is set via tmXBLabelStride. tm_8.ncl: Shows the various ways you can change the formatting of the numeric tickmark labels using the tmXXFormat resources. This example just uses the tmXBFormat resource, but note that the same format rules apply to other formatting resources, like tmYLFormat, cnLineLabelFormat, vcScalarValueFormat, and any numeric formatting resource ending in "Format". 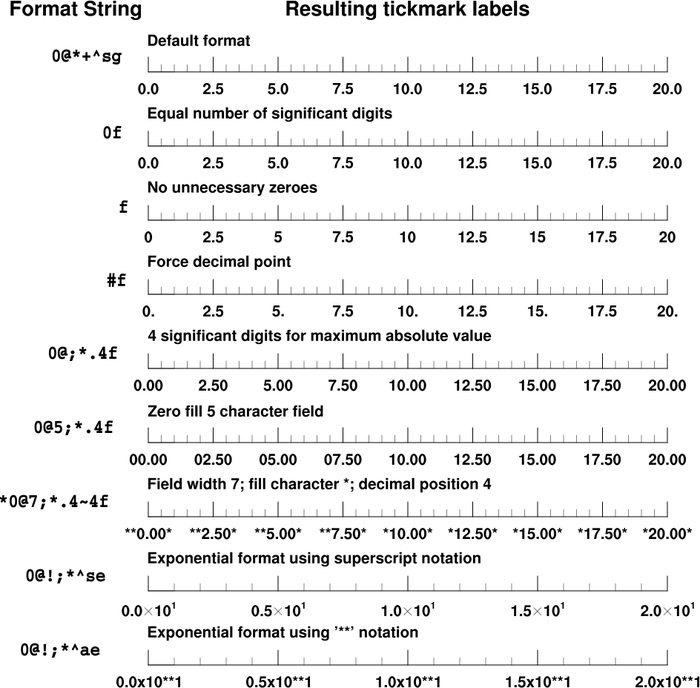 For more information on formatting numeric labels, see the format conversion specification strings section. tm_9.ncl: Demonstrates how to label the right Y-axis differently than the left Y-axis. 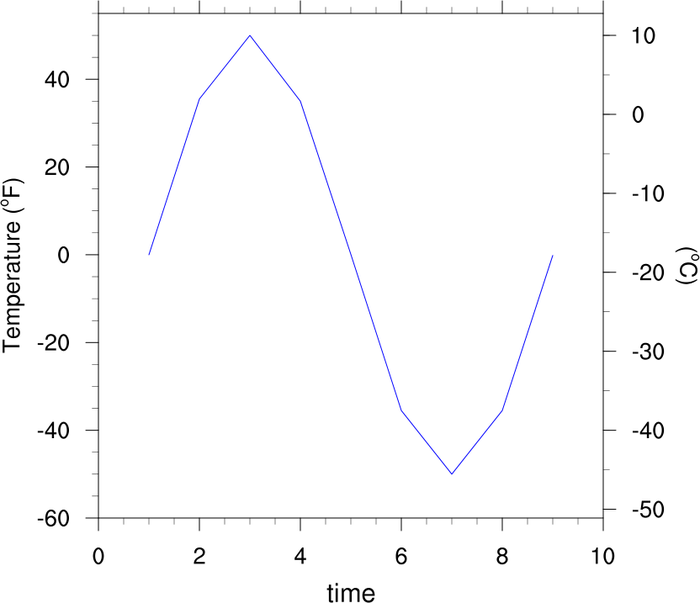 The first plot is drawn with only the lefthand Y-axis tick mark labels. After gsn_csm_xy is called, getvalues is used to retrieve the tmYLValues from the plot. The tmYLValues are then used to locate the tmYRValues / tmYRLabels. setvalues allows you to modify a previously created plot by setting/modifying resources. 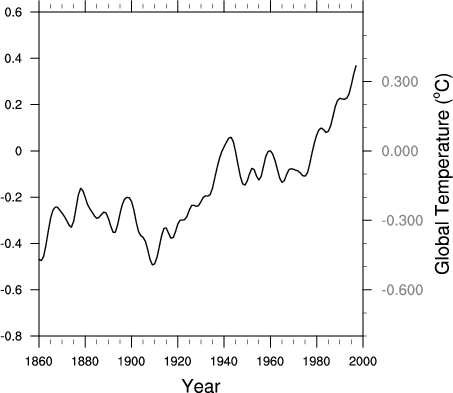 The Celsius labels on the righthand Y-axis of the first plot were automatically created based on the Fahrenheit labels from the lefthand Y-axis. This results in awkward Celsius labels. 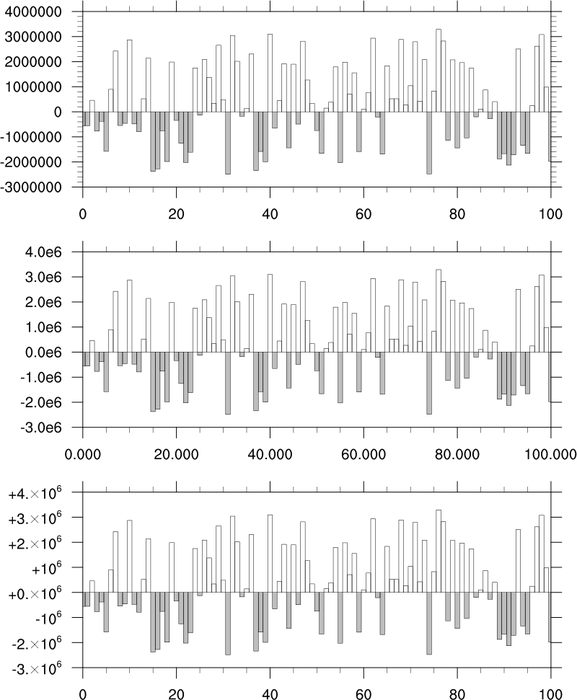 The second plot shows how to manually set "nice" Celsius labels, along with minor tickmarks for the righthand Y-axis. tm_10.ncl: Demonstrates how to label both the minor and major tickmarks. 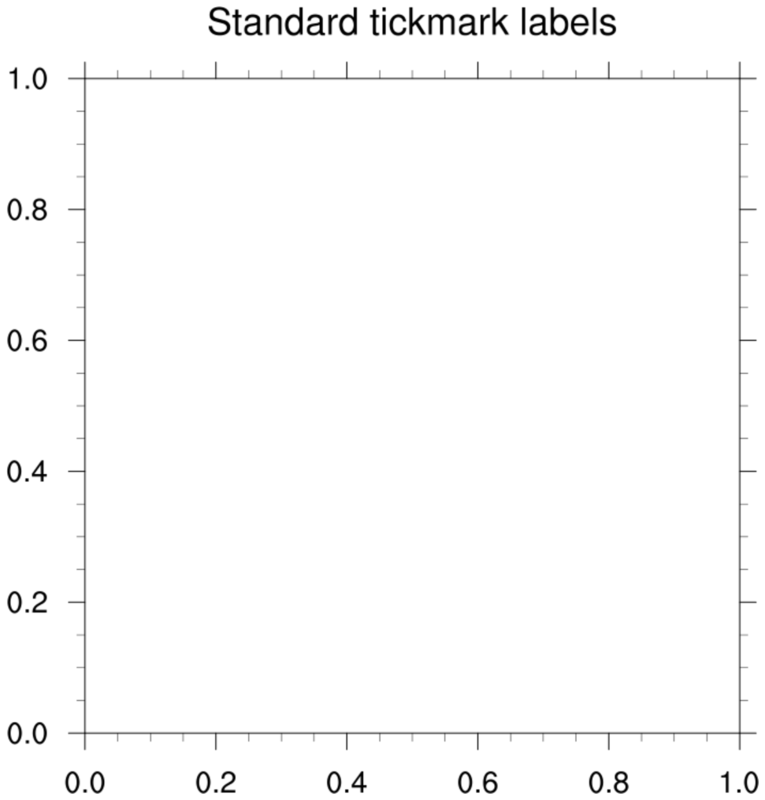 This particular method draws the same plot twice: the first time labeling the major tickmarks, and the second time by treating the minor tickmarks as major ones, and labeling those. 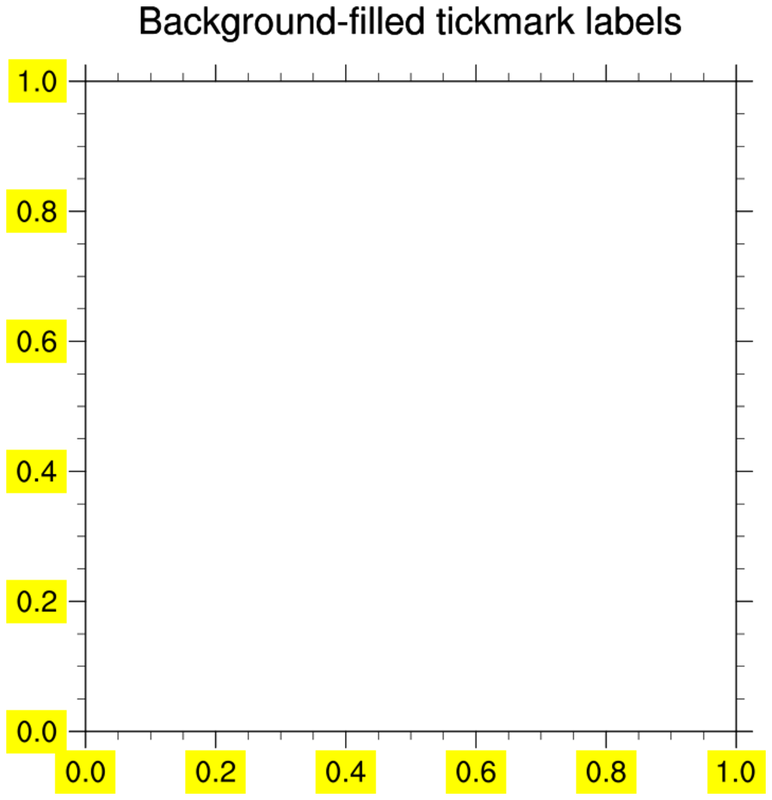 tm_11.ncl: This example is identical to example 10, except it uses the function gsn_blank_plot to create a new tickmark object to overlay on the original plot. This method can be faster than the previous one, especially if the initial plot is time-consuming to create. tm_12.ncl: This script shows how to customize tickmarks by creating your own using gsn_text_ndc. In this script, the customized tickmarks are drawn with a background fill color of yellow, which you cannot do with regular tickmark labels.